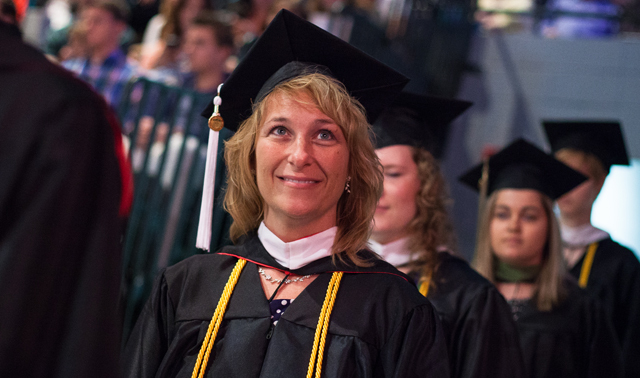 Saturday’s commencement ceremony at Grace College and Seminary was a day to remember. Photos from the event may be viewed by clicking here. The class was comprised of students from 28 states and 16 countries, including Albania, Argentina, Australia, Brazil, Canada, France, India, Kenya, Macedonia, Mexico, Mongolia, Philippines, South Korea, Spain, the United States, and Zimbabwe. 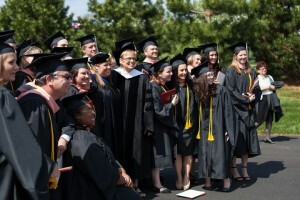 A total of 181 Baccalaureate degree recipients earned graduation honors and wore gold tassels, cords or sashes at commencement. Over the past few years, Grace has been implementing new and innovative options to offer an affordable Christian education to more students. This year, Jacob Goodman was the first graduate from the Grace/Trine Engineering partnership with a degree in Applied Physics in addition to his Civil Engineering Management degree. Caleb Sanders was the first graduate of the 3+1 blended program with a Master of Business Administration. Also receiving degrees were first-time graduates from Grace’s new 3-year Reimagine program, the Medical Device Quality Management program, the Exercise Science program, and the Weber schools in Indianapolis and Fort Wayne. May 10 also marked the end of the first year of presidency of Dr. William Katip, who stepped into leadership during last year’s commencement. Dr. Katip brings 39 years of higher education experience to the presidency and has been invaluable in guiding Grace Schools through many innovative changes since 2007.